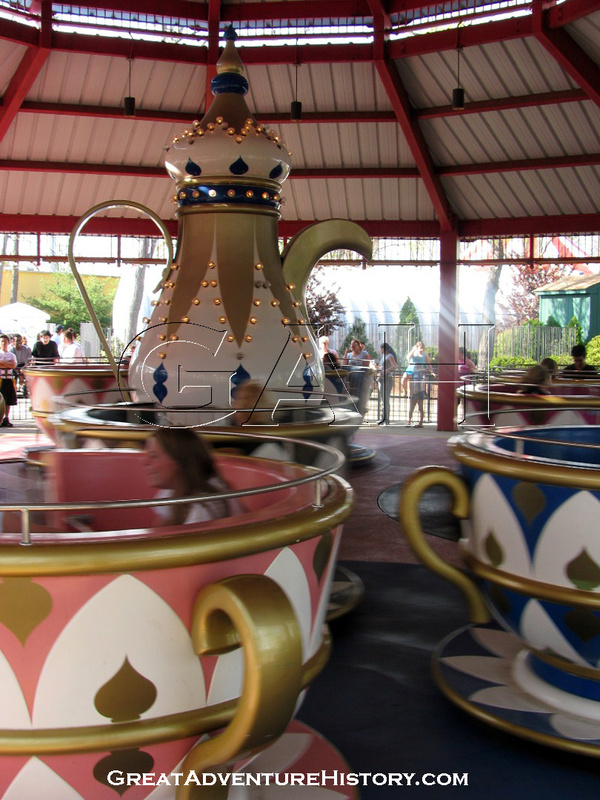 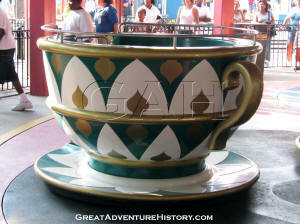 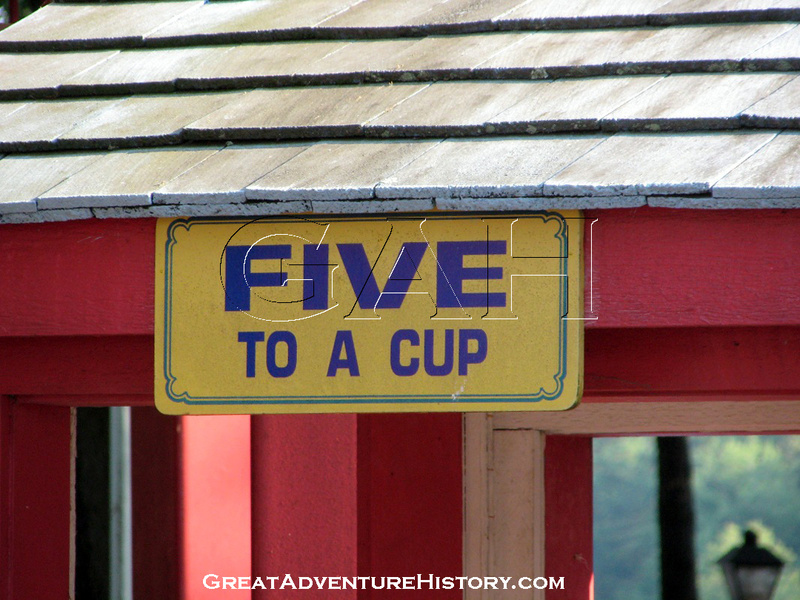 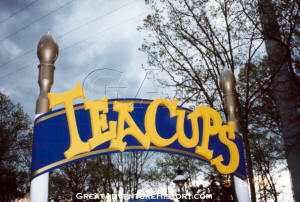 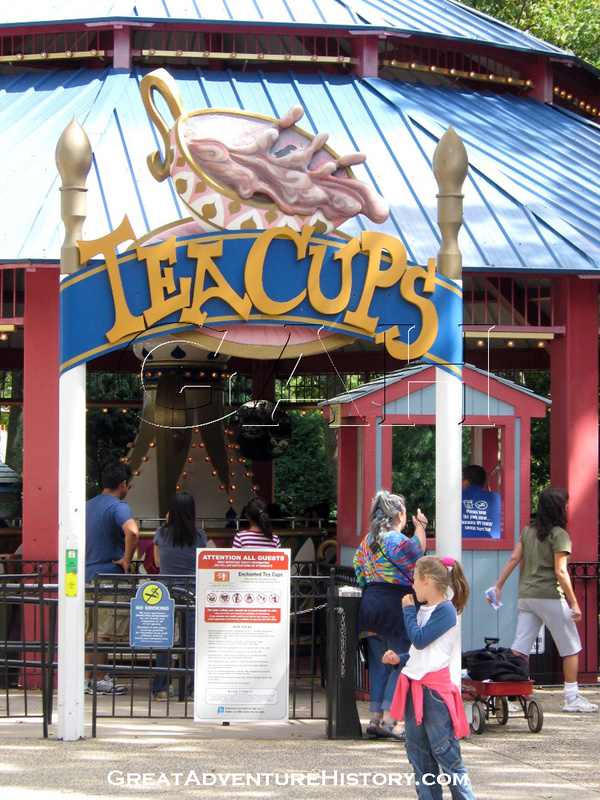 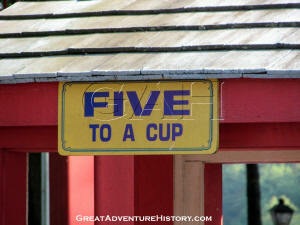 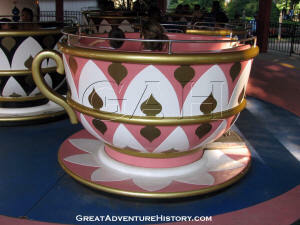 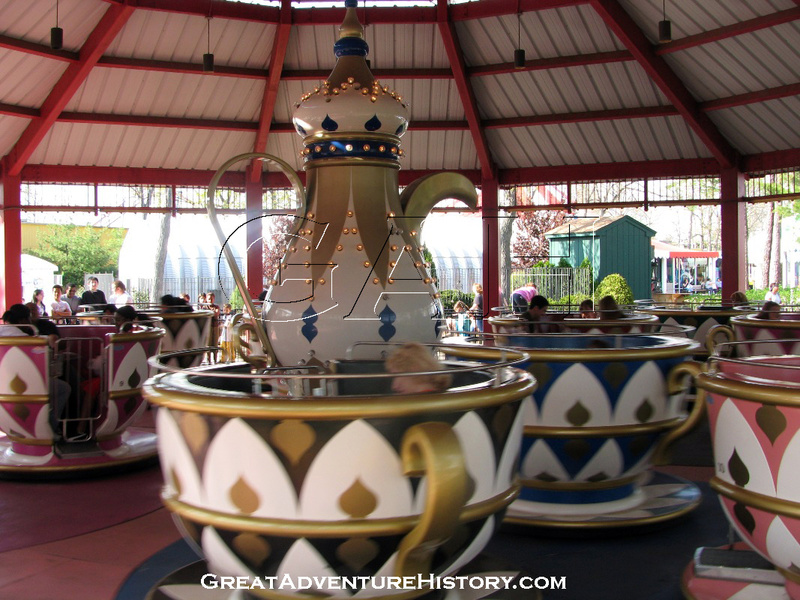 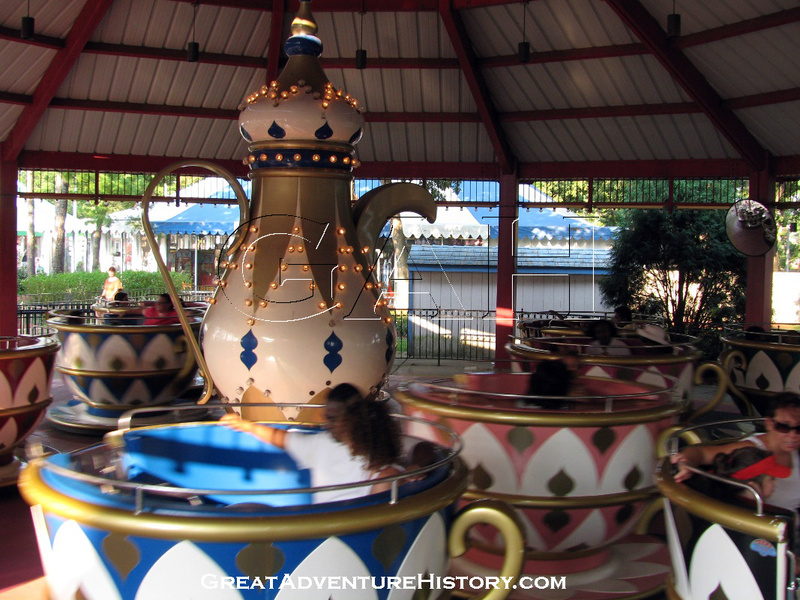 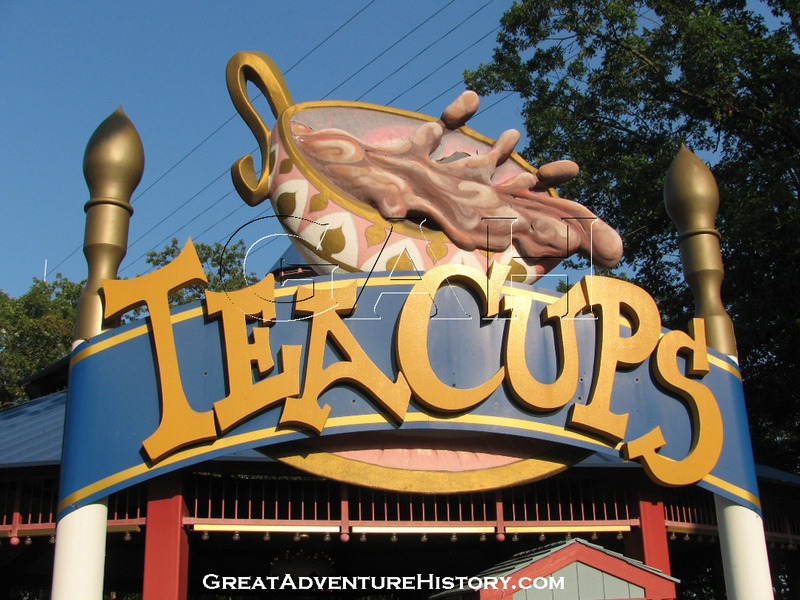 One of the mainstays of theme parks around the world is the Teacup ride. After the huge success of the original Teacups at Disneyland, the ride has become a pop culture icon that guests expect to find in every park. 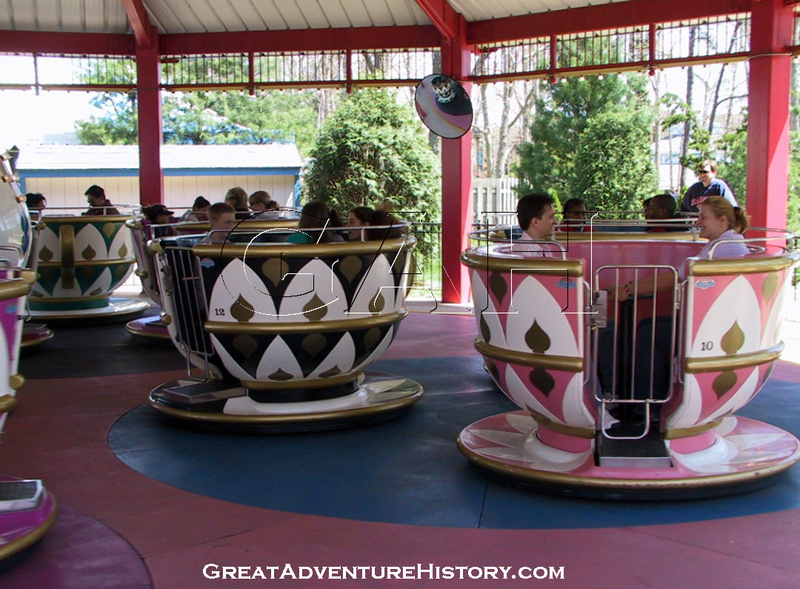 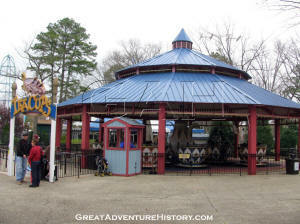 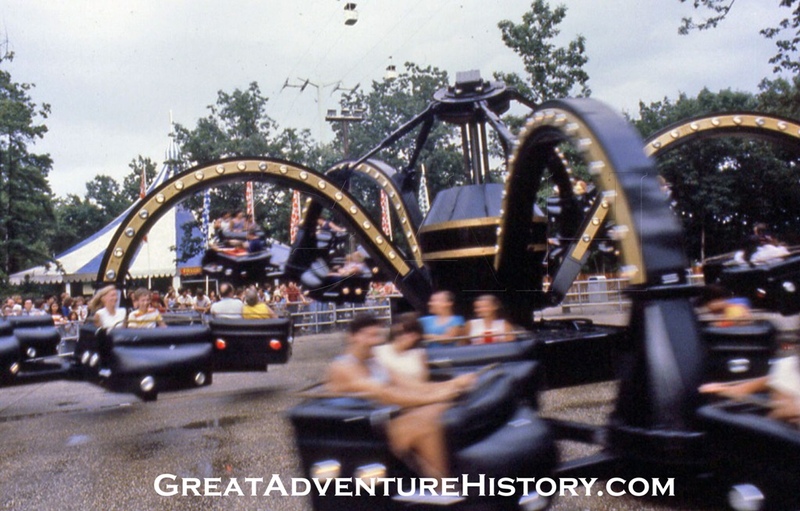 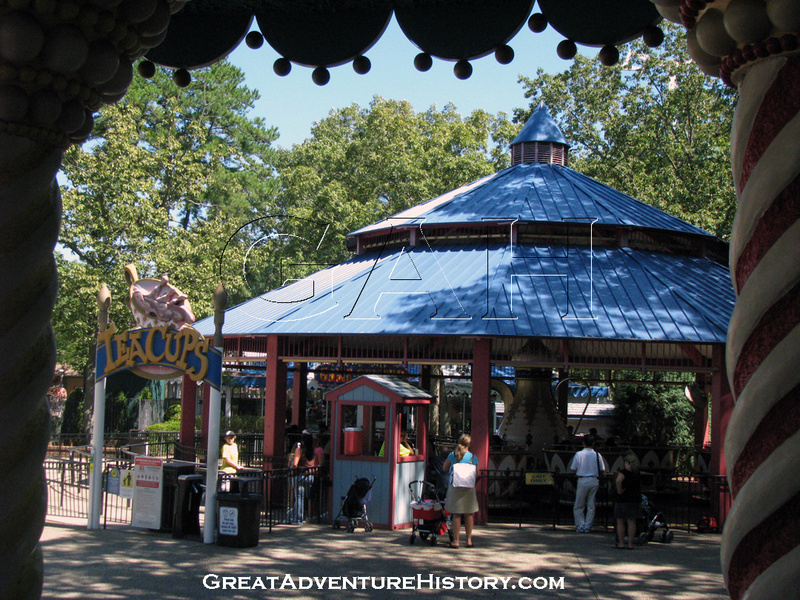 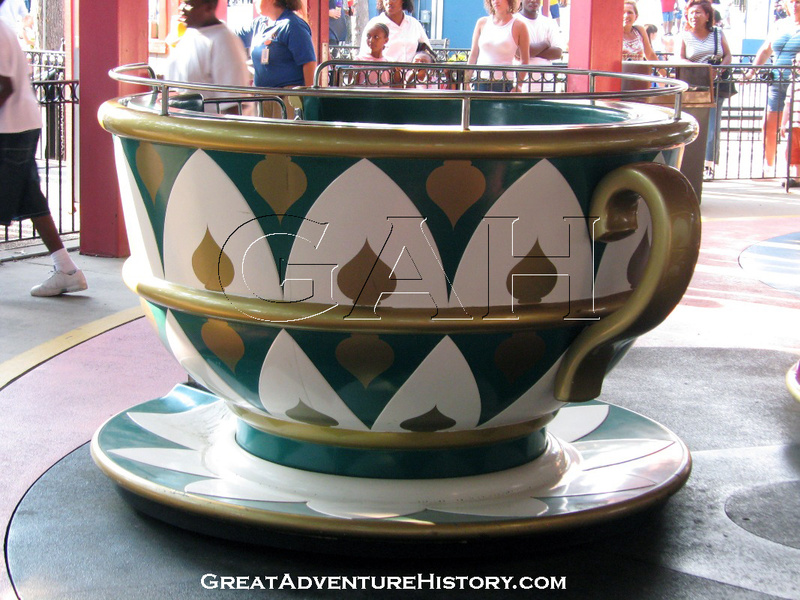 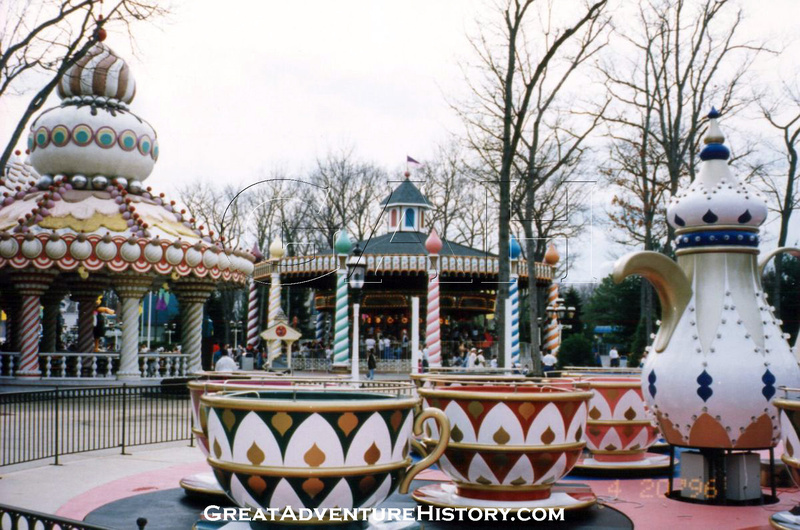 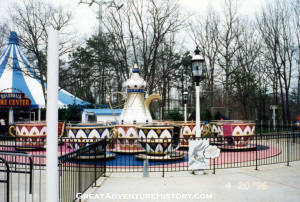 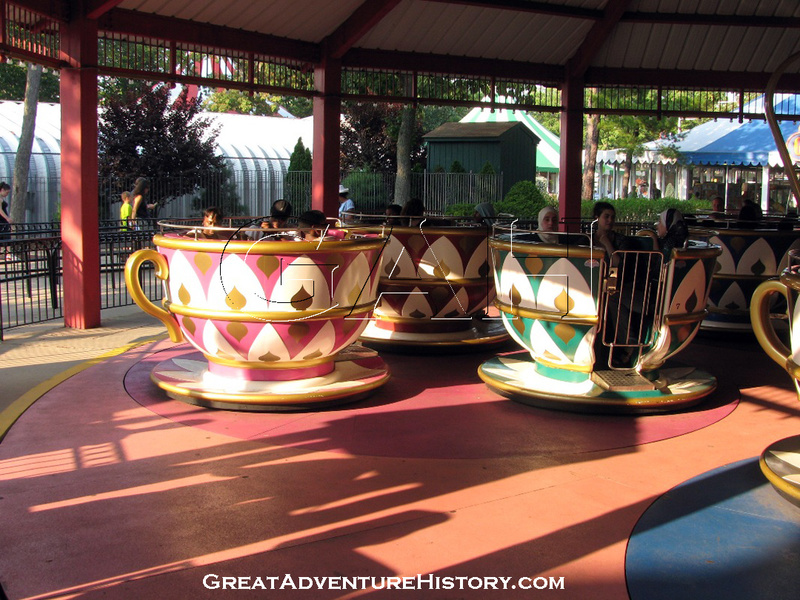 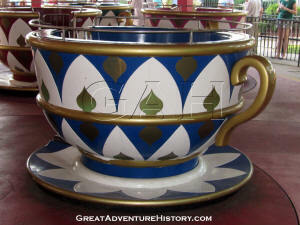 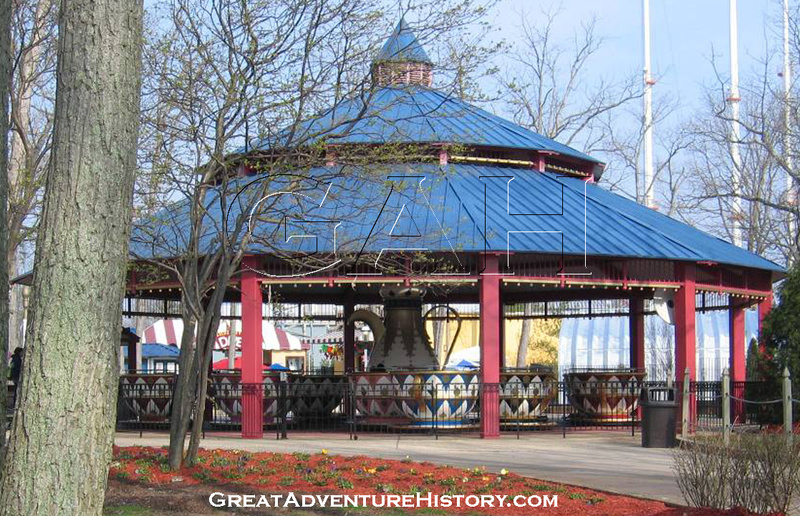 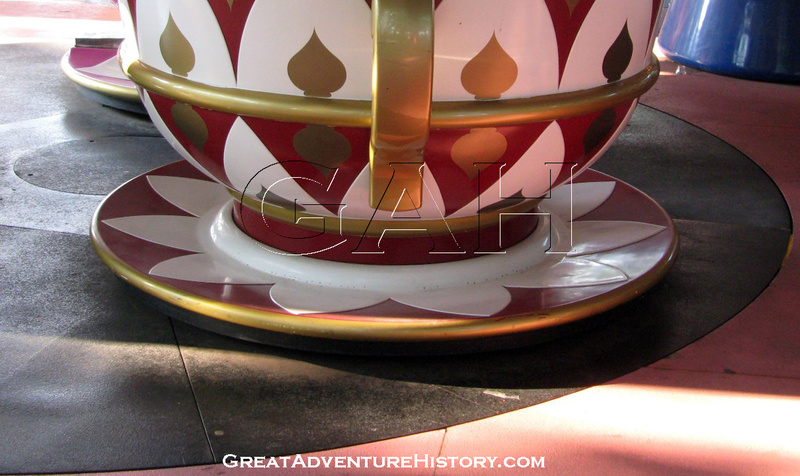 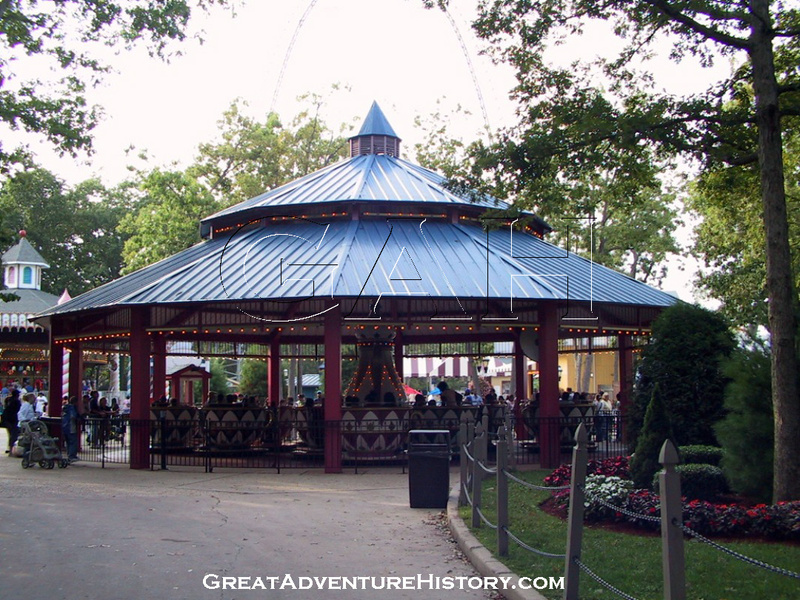 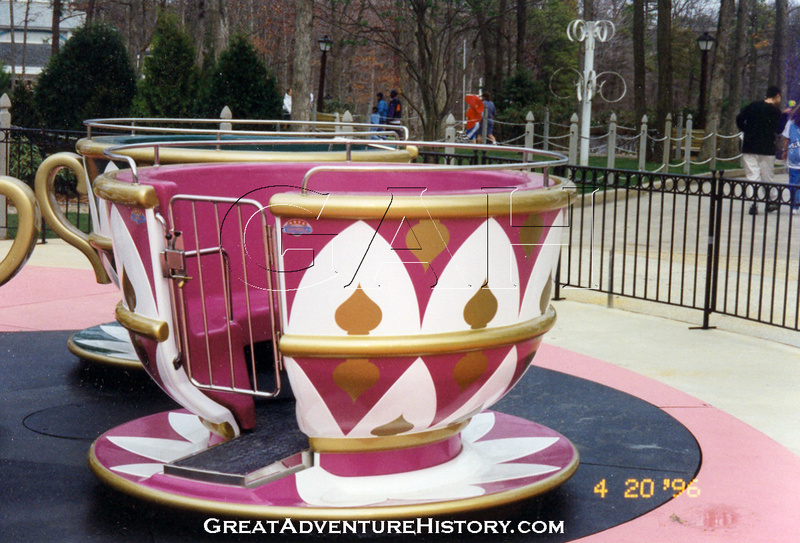 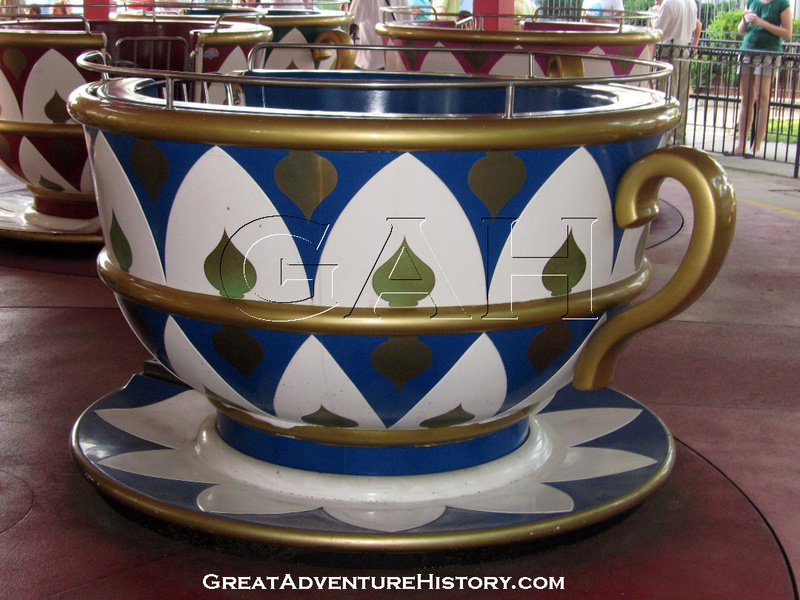 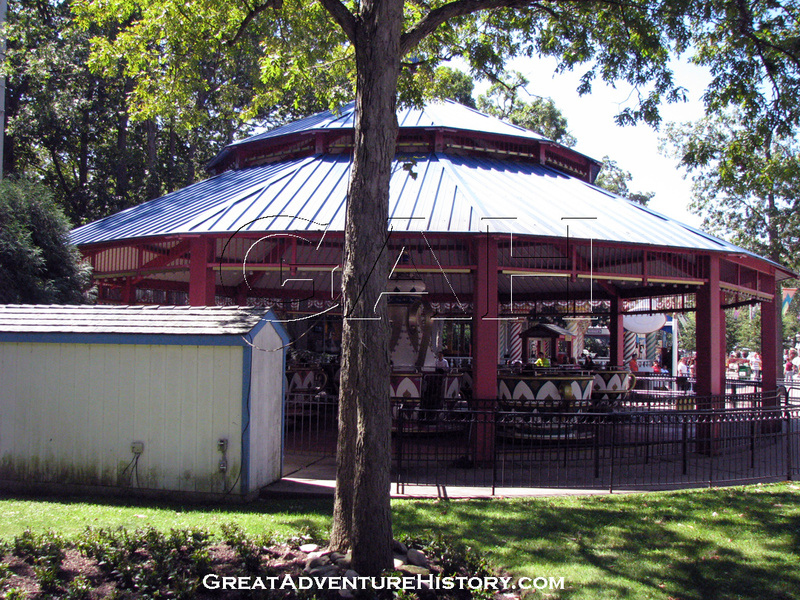 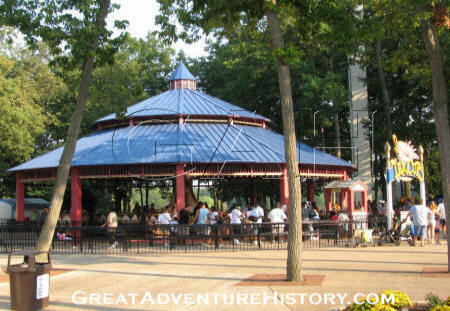 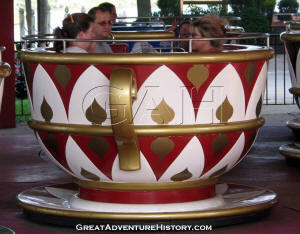 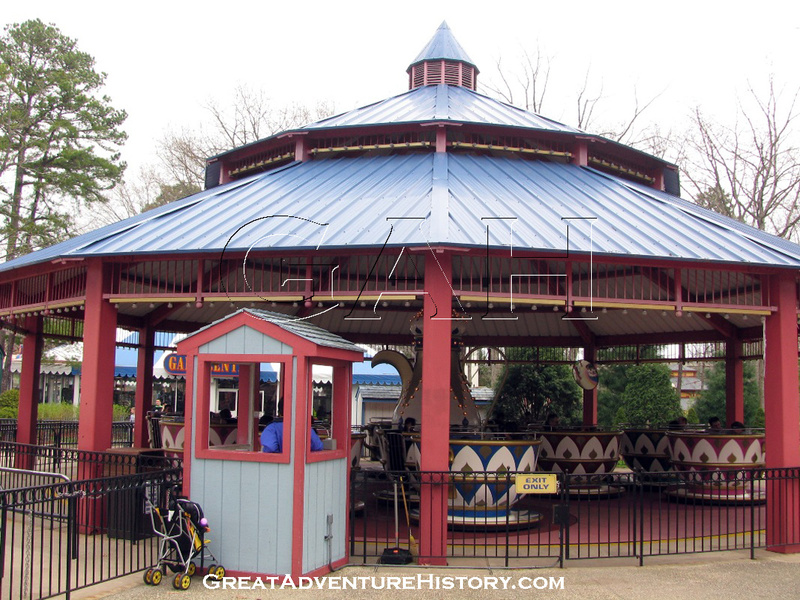 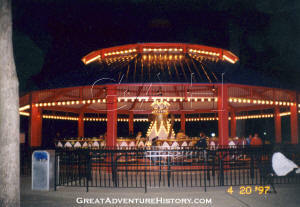 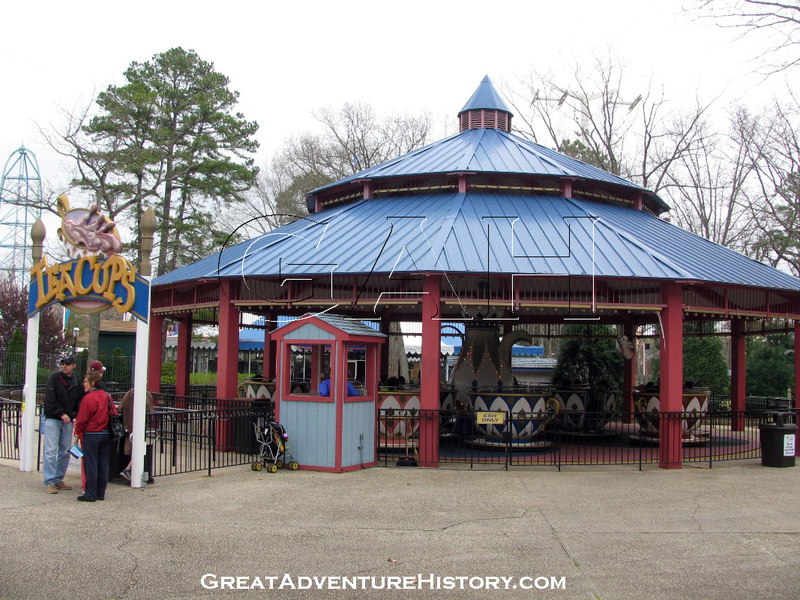 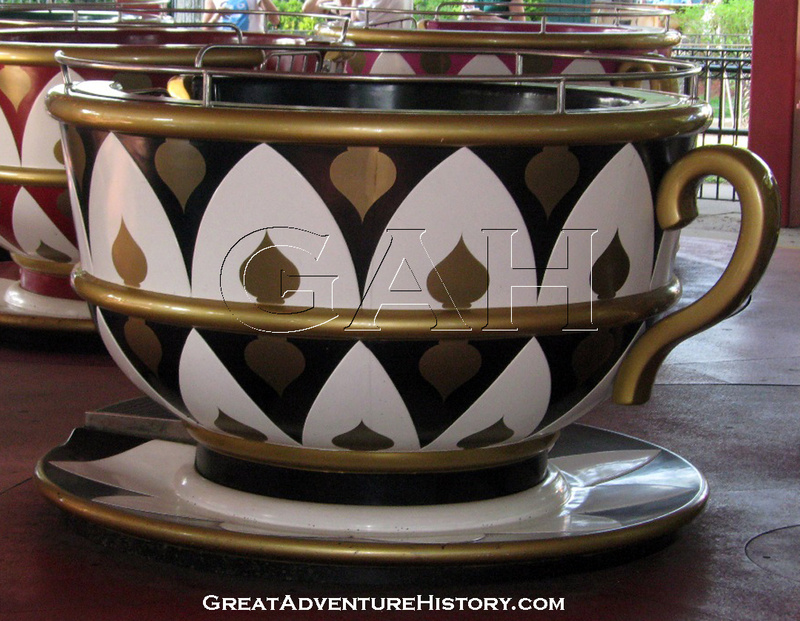 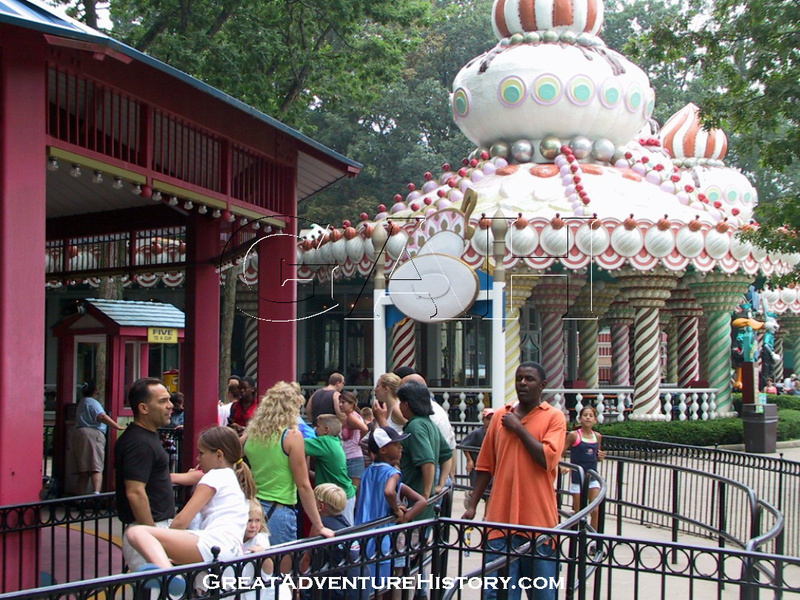 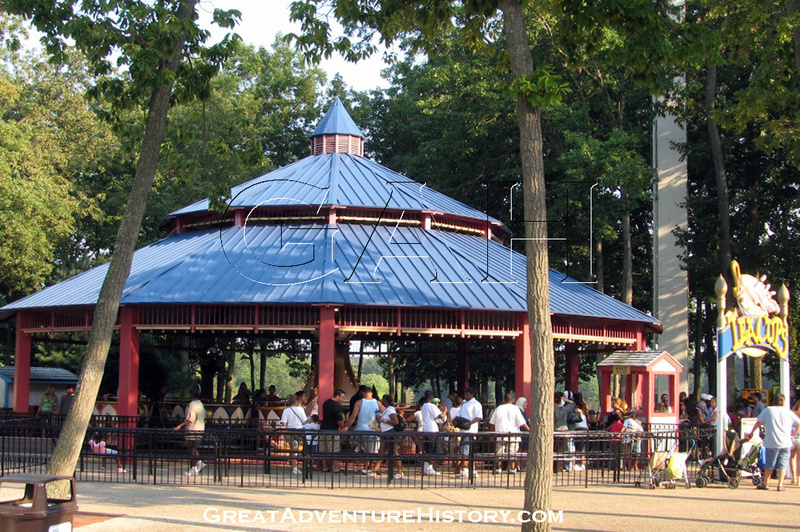 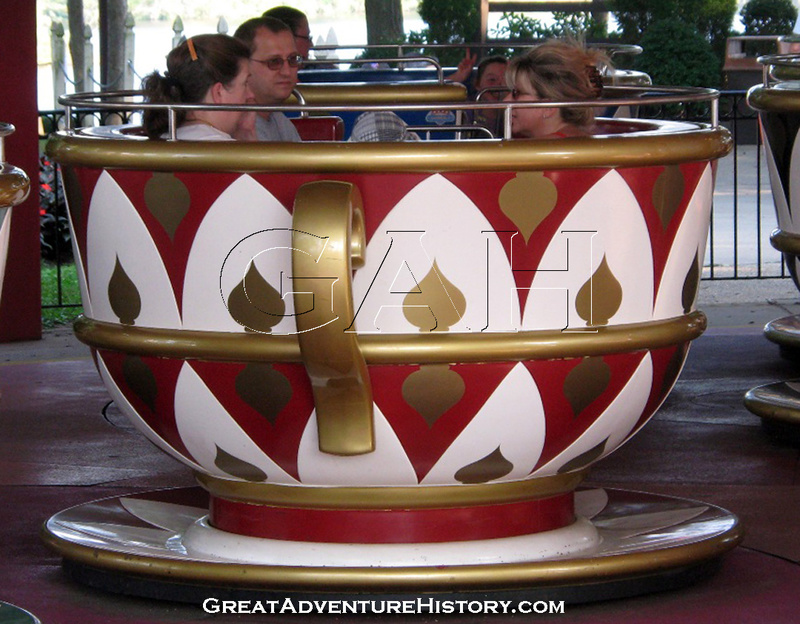 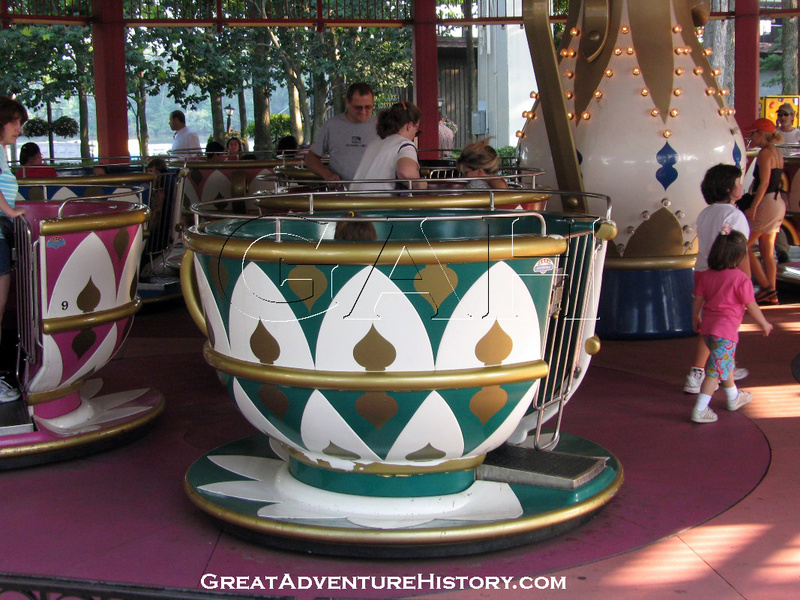 Great Adventure never had a set of their own Teacups until 1996, adding a standard production model 4 platform Zamperla Teacup ride. 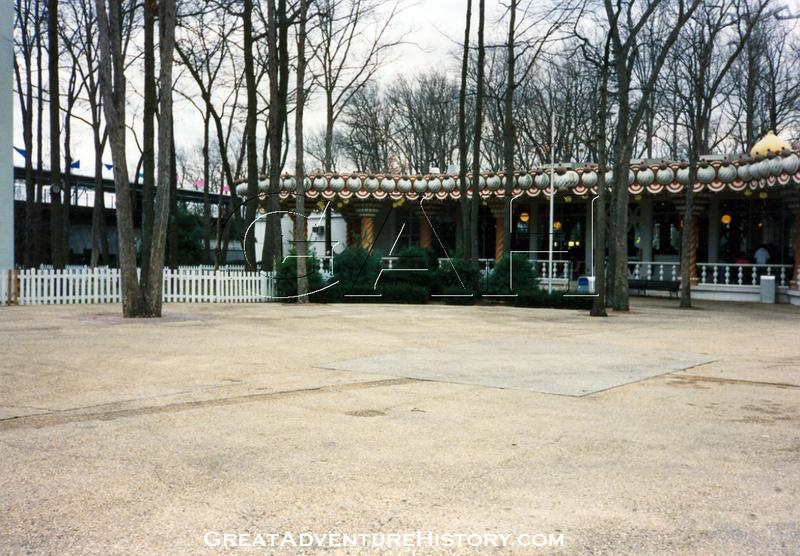 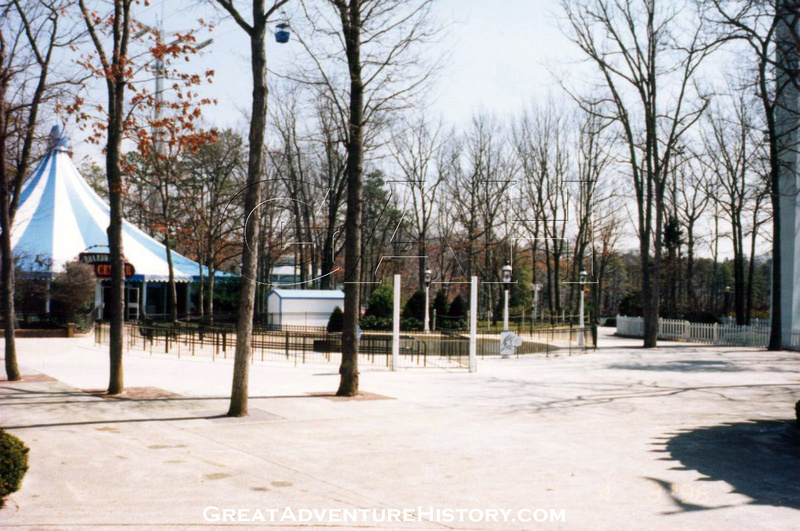 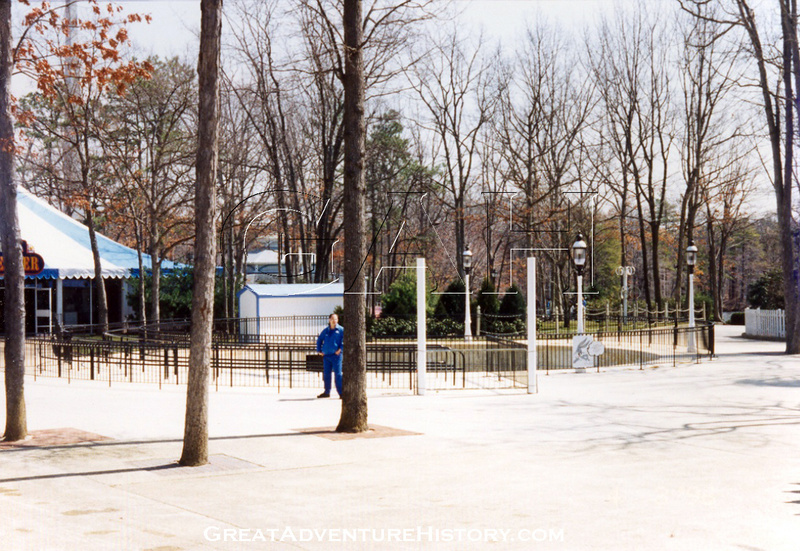 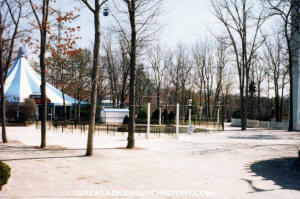 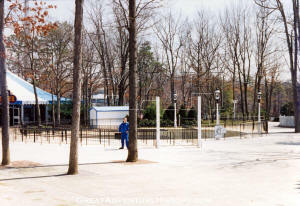 After several years of declining attendance through the late 1980's, the park turned around under the ownership of Time Warner, and the crowds got bigger and bigger, creating longer lines for all the rides in the park. 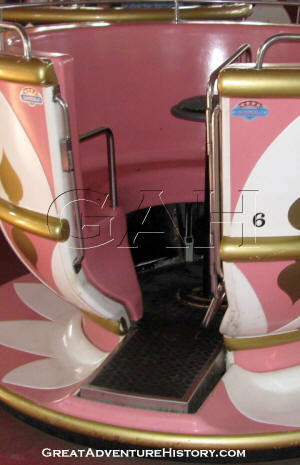 Many of the parks older flat rides had been removed over time and not replaced since the added capacity was not needed at the time. 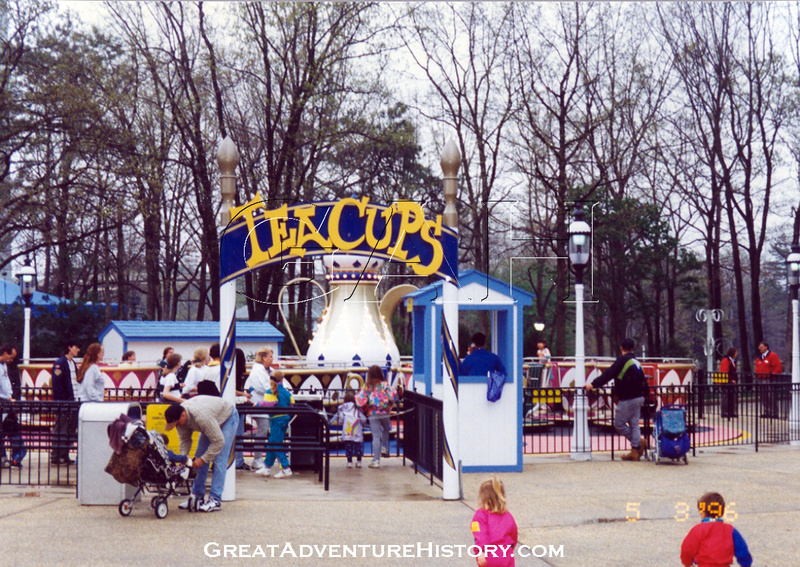 Additional rides were introduced or re-introduced to the park over the course of the 1990's adding the much needed ride capacity to handle the larger and larger crowds. 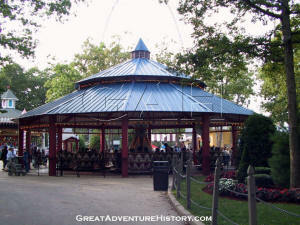 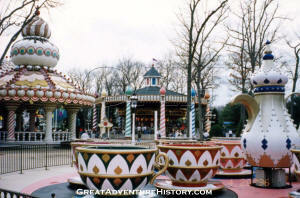 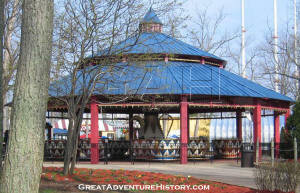 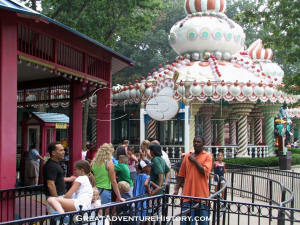 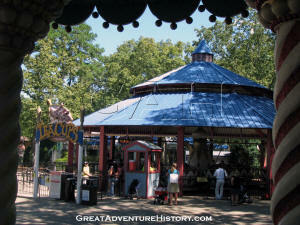 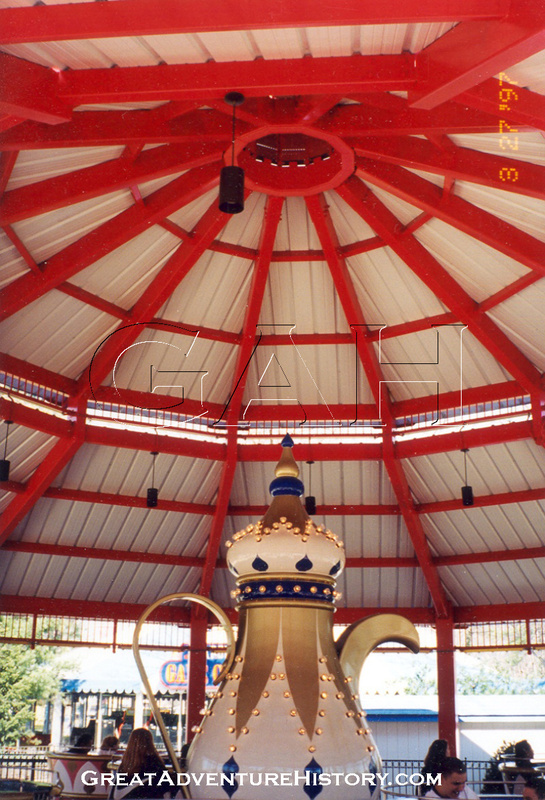 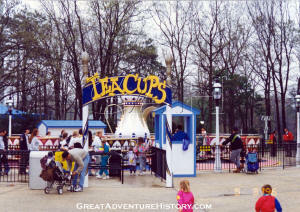 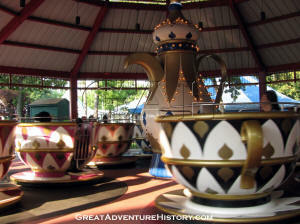 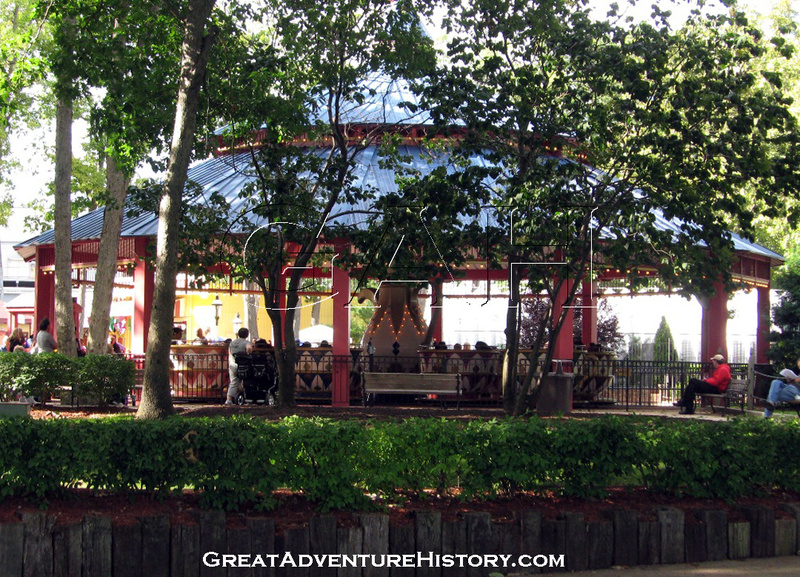 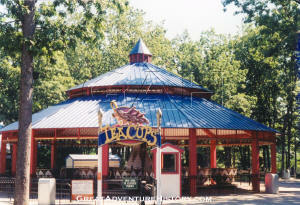 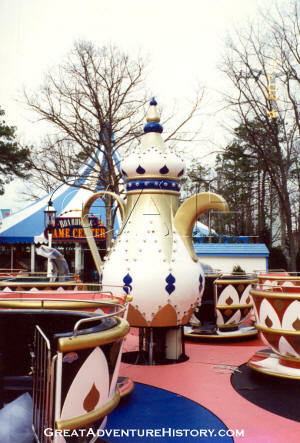 At the same time, Time Warner's emphasis for all the Six Flags parks was to add more themed attractions, and more "Disney style" rides, and no ride is more iconic in the Disney parks than the Teacups, so Six Flags added the Enchanted Teacups to the Fantasy Forest area of the park for the 1996 season. 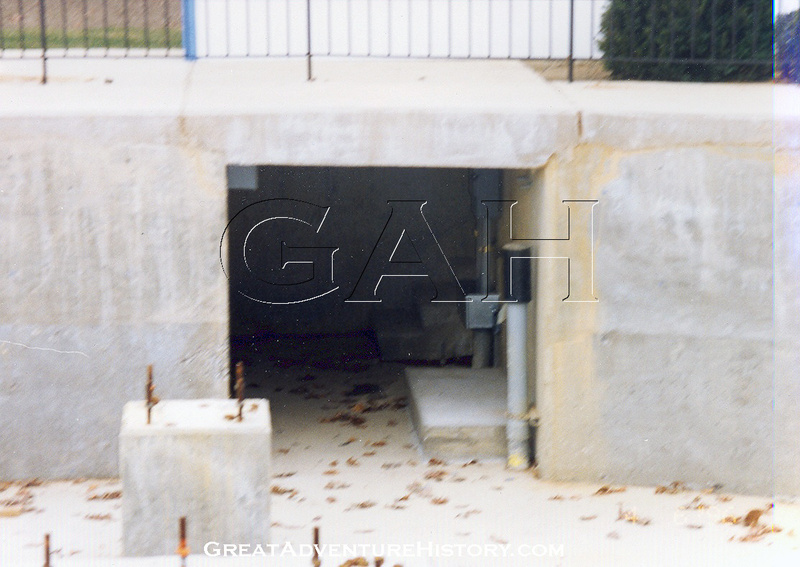 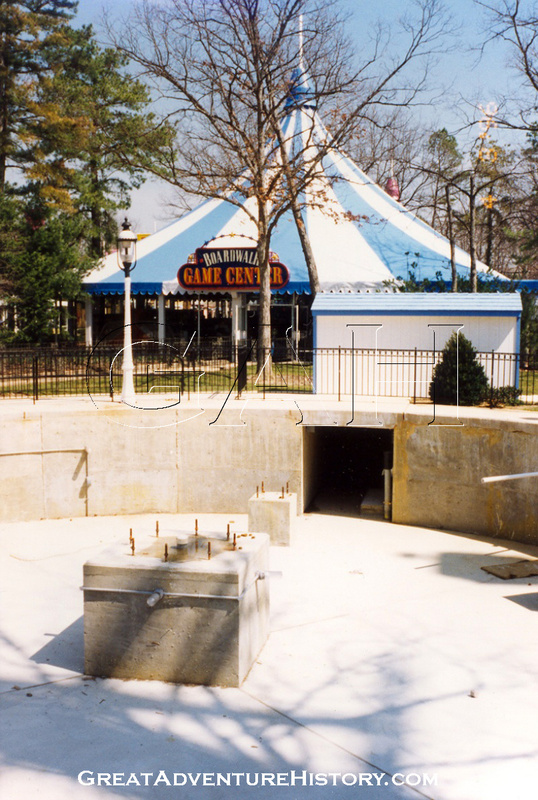 Site preparations involved creating a large concrete pit, with a connecting tunnel to house the rides driveshaft connecting it to it's remotely located motor housing. 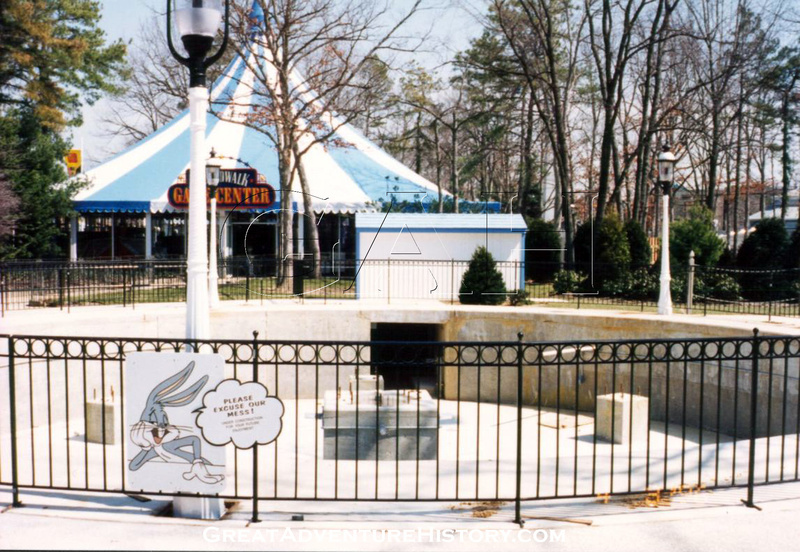 The site was vacant since the removal of the Monster Spin ride several years earlier, which had left a large, treeless area that had been used periodically for temporary show stages and events. 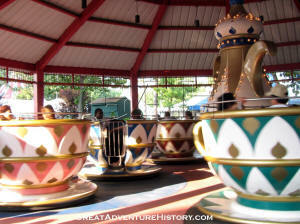 The colorful Teacups fit the Fantasy theme with the neighboring Yum Yum Palace next to it, and offered family fun and high capacity for fast moving lines. 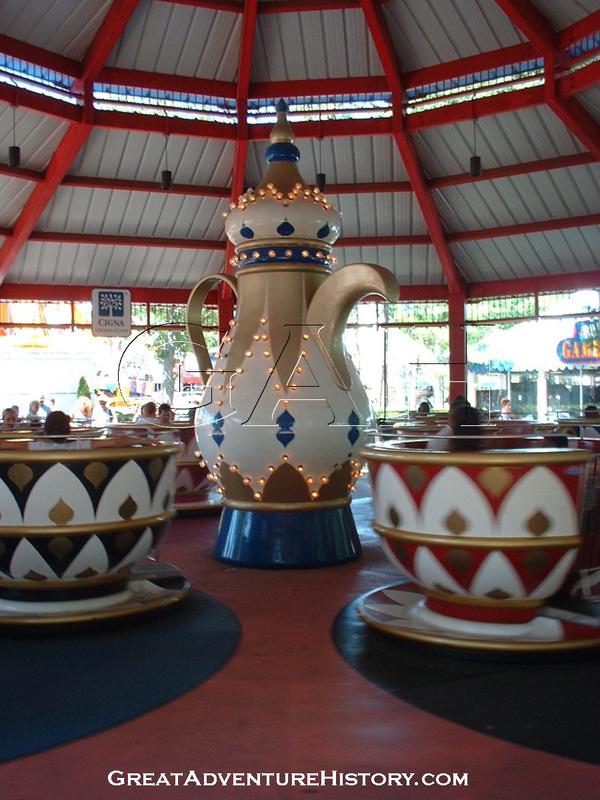 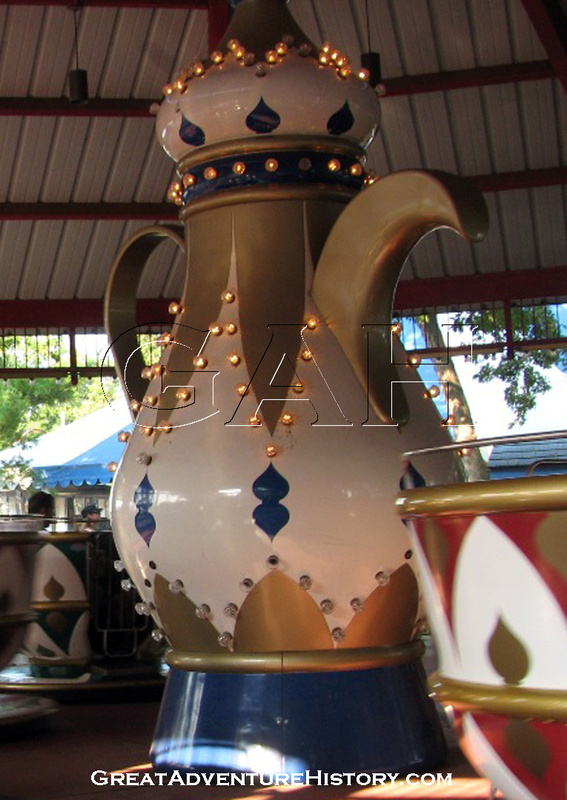 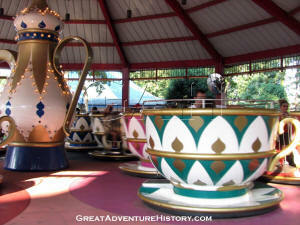 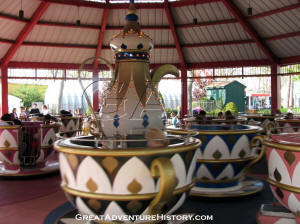 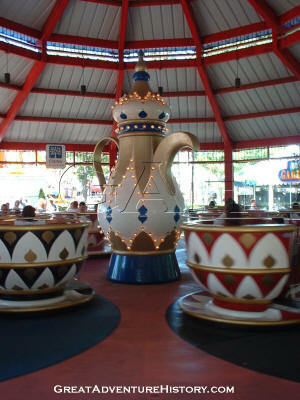 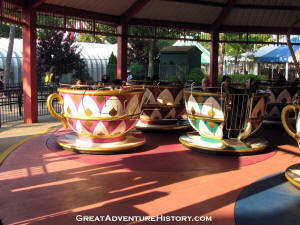 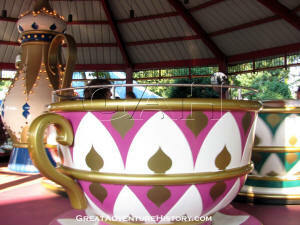 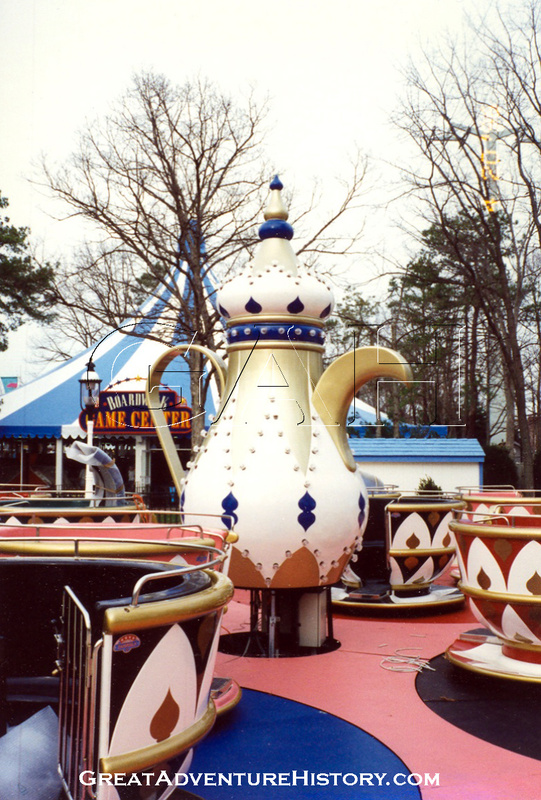 The ride featured a standard theme package with the colorfully painted cups circling a giant central teapot. 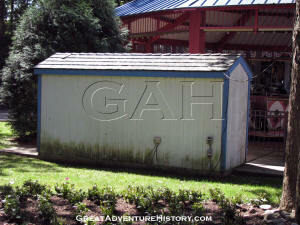 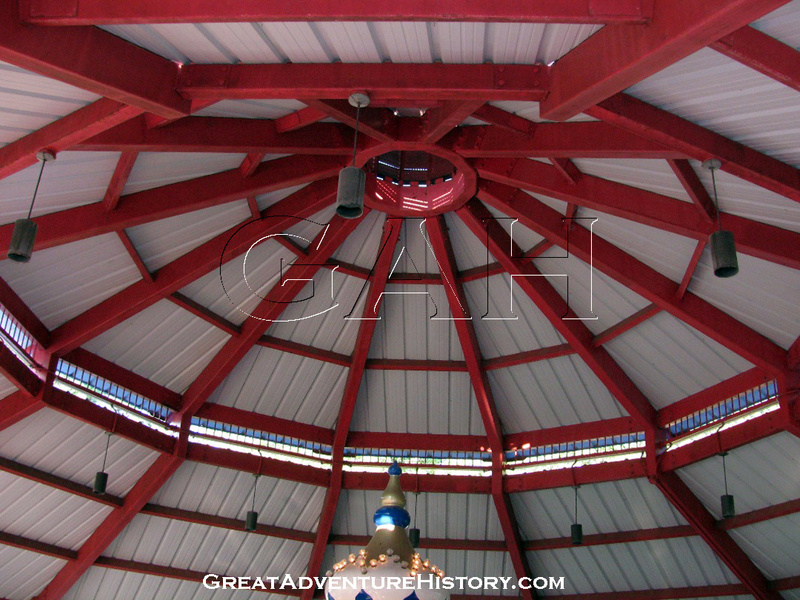 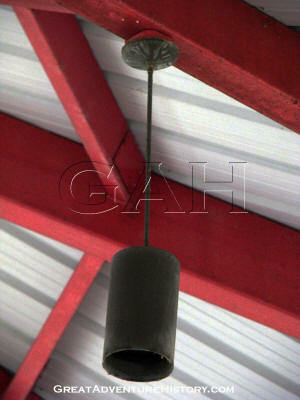 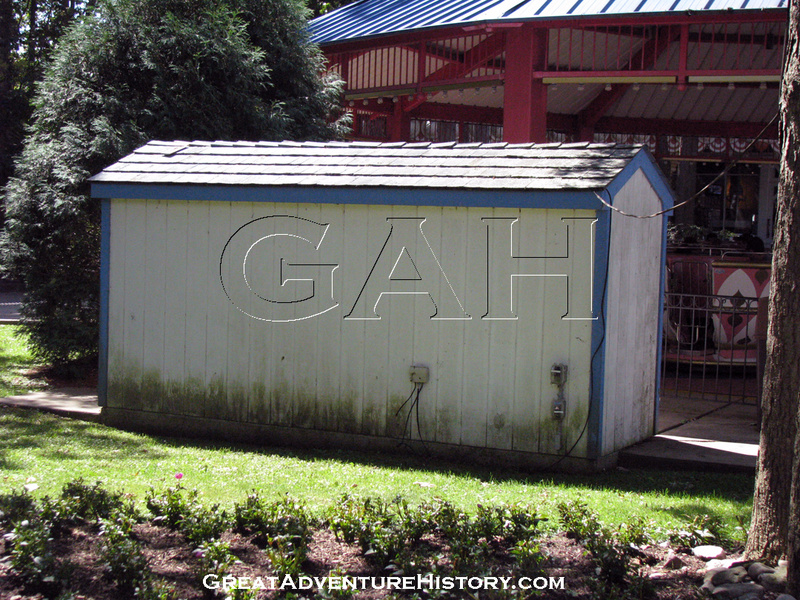 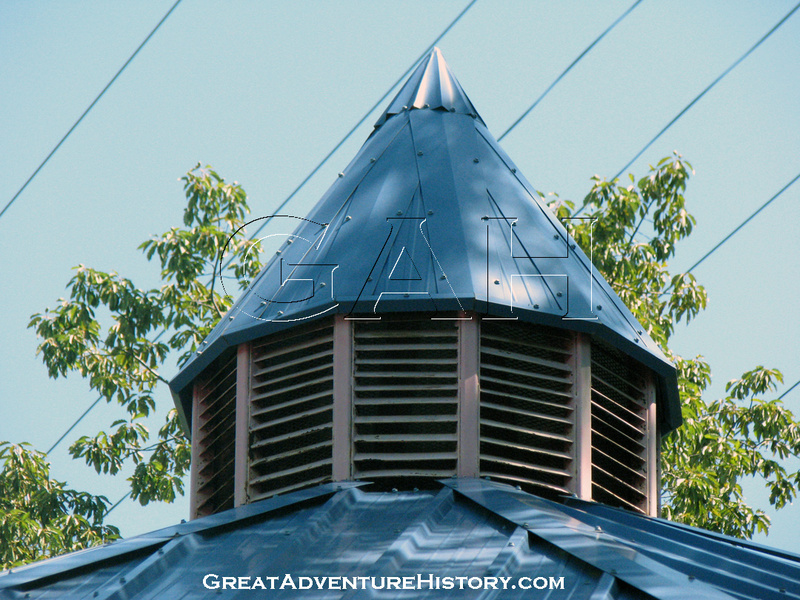 After operating in the open air for a single season, a structure was added over the ride, providing not only protection from the rain, but more importantly from the summer sunshine. 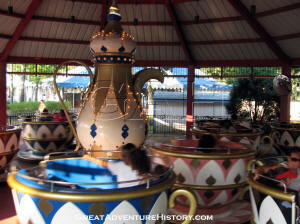 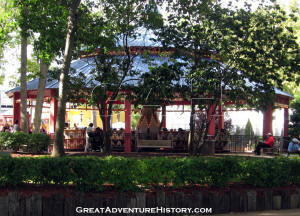 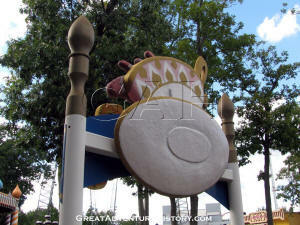 The ride's location in the middle of an area with no shade made riding in the Teacups uncomfortable with the hot seats. 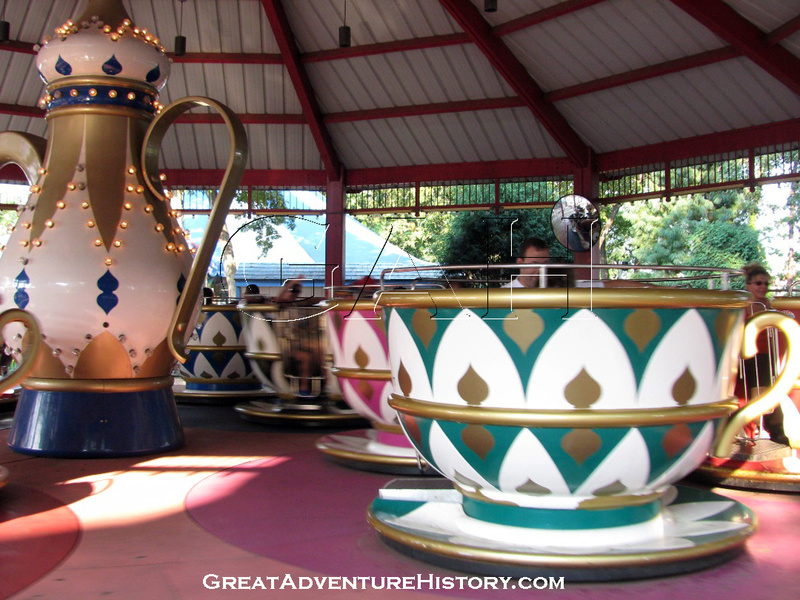 The Teacups are officially called "The Enchanted Teacups" according to most park literature though the sign has always just said "Teacups" on it. 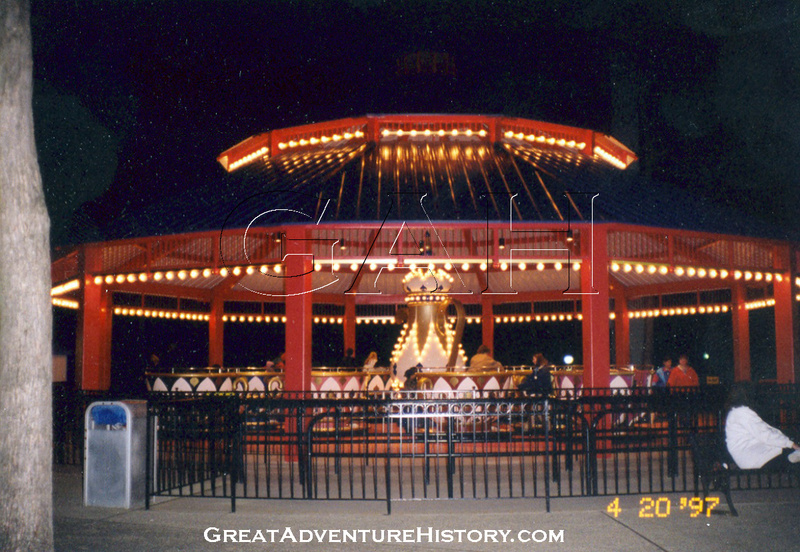 Originally the sign was simply the name mounted on poles that echoed the look of the neighboring Carousel building columns with golden spires. 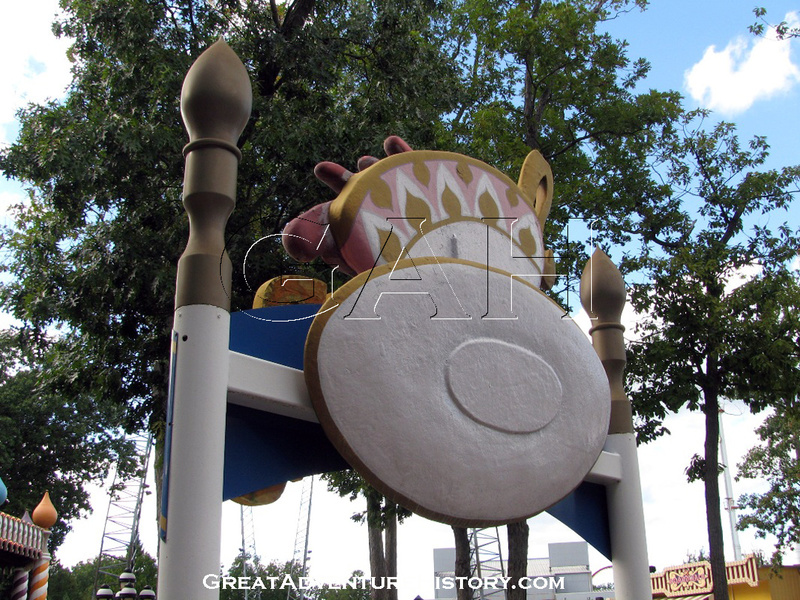 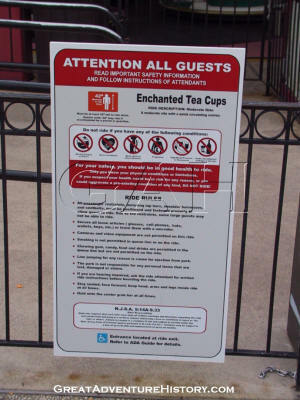 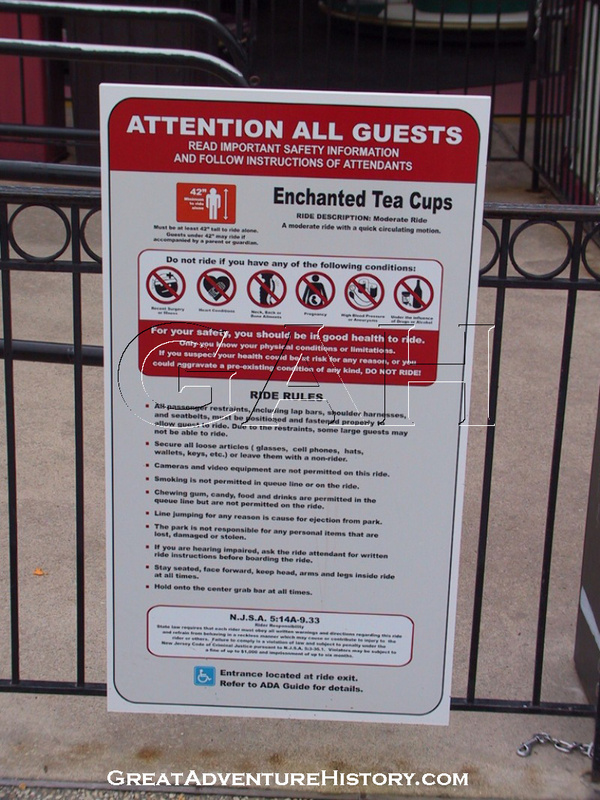 Over time the now familiar dimensional teacup was added behind the sign. 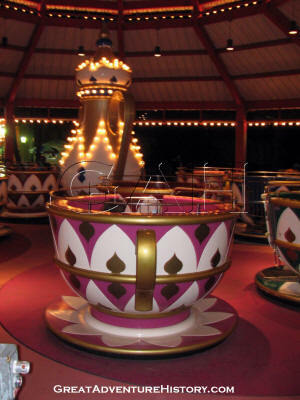 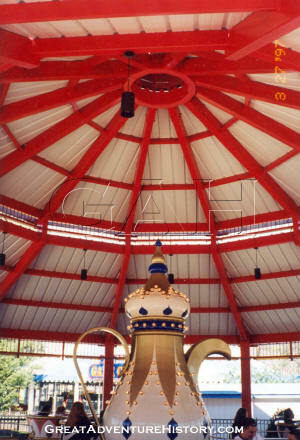 The Teacups roof structure was the first attraction in the park to utilize more energy efficient lighting, with the each of the lights ringing the ride actually being comprised of several micro-bulbs instead of a single filament. 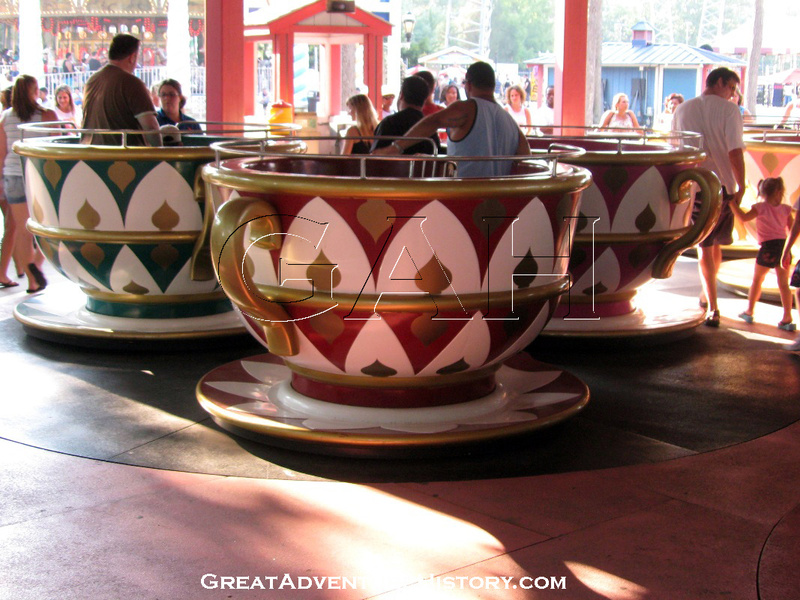 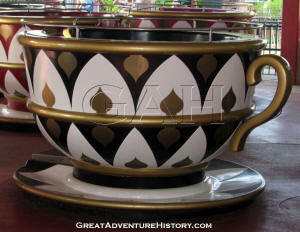 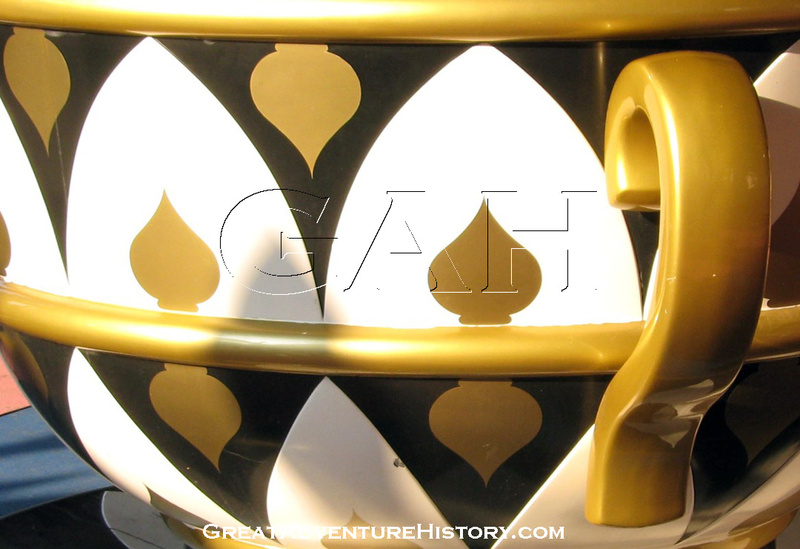 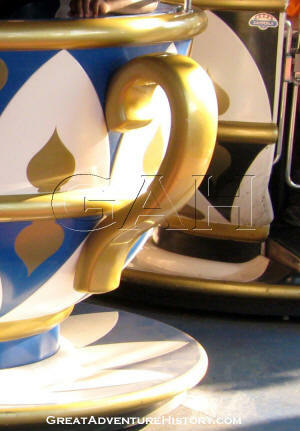 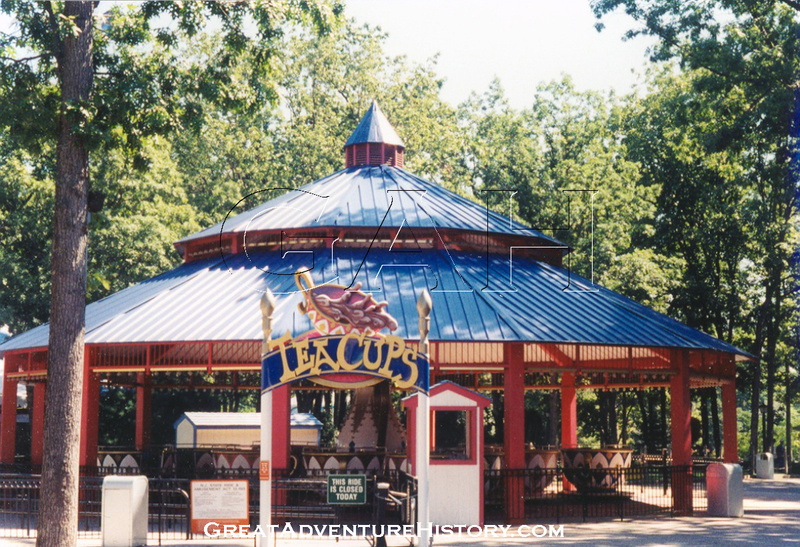 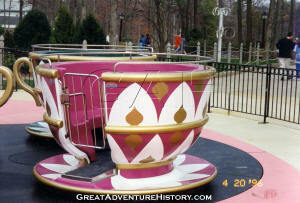 Since its opening in 1996, the Teacups have provide dizzying thrills to thousands of guests. 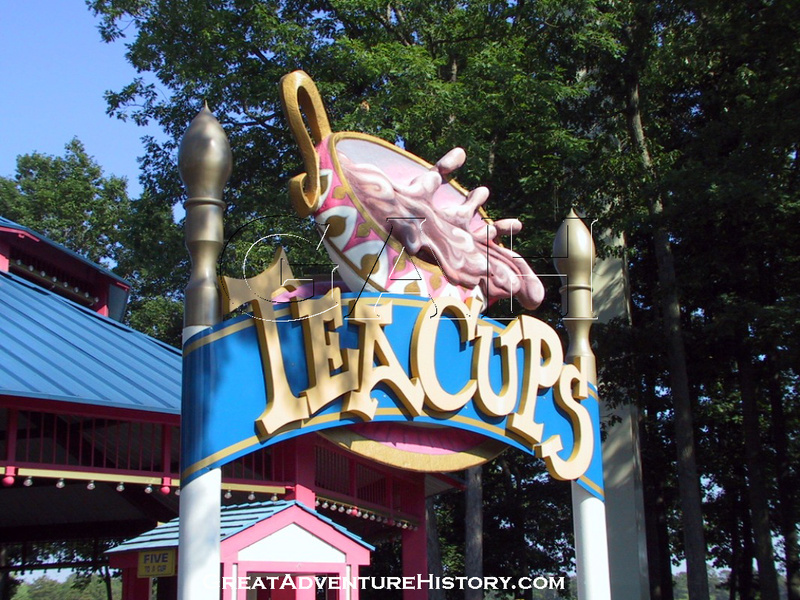 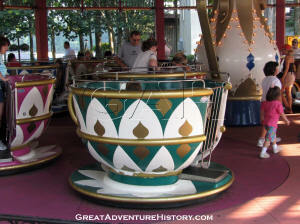 Towards the middle of the 2006 season, the Teacups began to suffer a great deal of downtime from age. 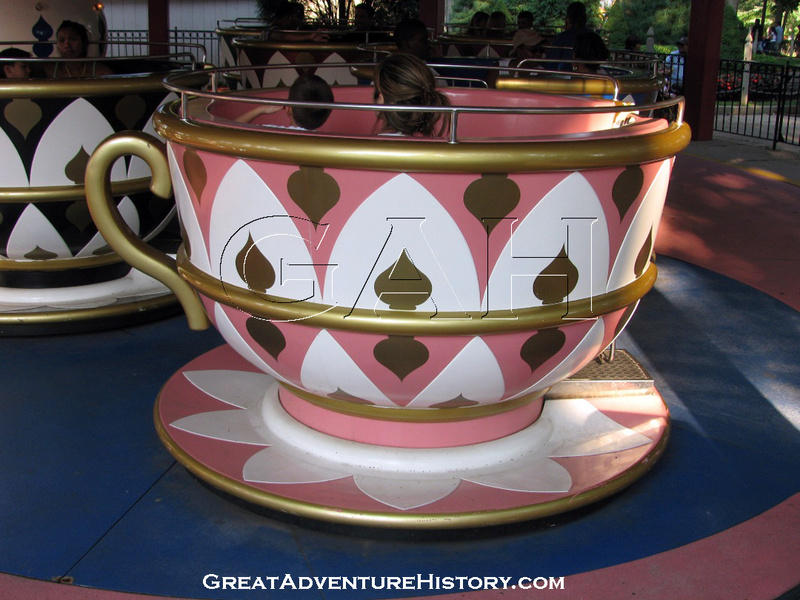 Initially the park had listed the Teacups as closed for the year in August, but by September the ride had been repaired and re-opened for the rest of the season. 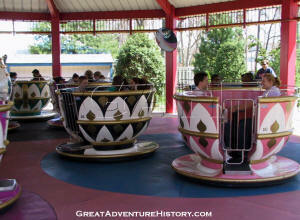 The Enchanted Teacups continue to delight families on Dream Street offering a dizzying delight.